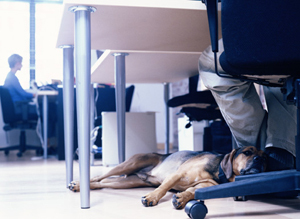 Home » News » Is having a dog under your desk better than having the corner office? We all know the feeling. You get home from a tough day at work: you’re tired, you’re stressed, you’re preoccupied with the day’s events. But then, you open your door, and there’s the dog, wagging at 1000 RPM. There’s your cat rubbing against your leg and purring. That “ahhhh” is from the proven benefits of pet ownership: your blood pressure drops, your levels of stress hormones decrease, and your sense of well-being increases. Researchers who study the workplace wanted to know if having a dog (sorry, cat owners) at work provided the same type of health benefits at work as it does at home. They published their findings in the International Journal of Workplace Health Management. Compared with a control group, workers who were allowed to bring dogs to work had lower levels of stress hormones in their saliva. When the dogs were taken away, the stress levels returned to that of the control group. Their conclusion: dogs are helpful in alleviating workplace stress. Consider that even the Centers for Disease Control (CDC) publishes the health benefits of having pets. Their health education website cites research on the physical and mental health benefits. They go on to state that pet owners have increased opportunity for exercise, outdoor activities, and socialization. Famously worker-friendly companies like Google, Klutz, and Ben & Jerry’s allow workers to bring the best part of home to work with them. Isn’t it time your company did?